Lydia Netzer, the award-winning author of Shine Shine Shine, weaves a mind-bending, heart-shattering love story that asks, "Can true love exist if it's been planned from birth?" Like a jewel shimmering in a Midwest skyline, the Toledo Institute of Astronomy is the nation's premier center of astronomical discovery and a beacon of scientific learning for astronomers far and wide. Here, dreamy cosmologist George Dermont mines the stars to prove the existence of God. Here, Irene Sparks, an unsentimental scientist, creates black holes in captivity. George and Irene are on a collision course with love, destiny and fate. They have everything in common: both are ambitious, both passionate about science, both lonely and yearning for connection. The air seems to hum when they're together. But George and Irene's attraction was not written in the stars. In fact their mothers, friends since childhood, raised them separately to become each other's soulmates. When that long-secret plan triggers unintended consequences, the two astronomers must discover the truth about their destinies, and unravel the mystery of what Toledo holds for them—together or, perhaps, apart. Lydia Netzer combines a gift for character and big-hearted storytelling, with a sure hand for science and a vision of a city transformed by its unique celestial position, exploring the conflicts of fate and determinism, and asking how much of life is under our control and what is pre-ordained in the heavens in her novel How to Tell Toledo from the Night Sky. 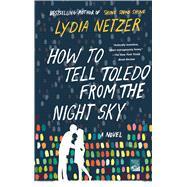 LYDIA NETZER was born in Detroit and educated in the Midwest. She lives in Virginia with her two home-schooled children and math-making husband. When she isn’t teaching, reading, or writing her next novel, she plays the guitar in a rock band. Her first novel, Shine Shine Shine, was a New York Times Notable, and a Los Angeles Times Book Prize finalist.